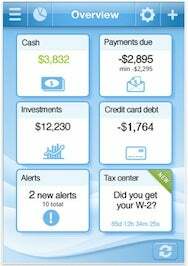 The taxman is gearing up for the big tax season, and now you can too, thanks to some new apps for your iOS devices. TurboTax has unveiled a full version of its popular financial software program for the iPad, and Pageonce has debuted a new feature in its mobile app, thanks to a partnership with H&R Block. TurboTax 2010 lets you fill out your federal and state tax returns on your iPad, even when you aren’t online. The app works just like the full version of the software on a Mac, and you can e-file and track both returns right from the app. TurboTax’s iPad app is free to download, but it costs at least $30 to file a federal tax return and $37 for state taxes. If you use H&R Block At Home to prepare your tax returns, you can now use Pageonce, the mobile finance app that keeps track of your debt and spending, to track your return’s status right from your iPhone. Just enter your H&R Block At Home username and password into the updated Pageonce app and you can track your refund or payments. Pageonce is available on the App Store for free or you can pony up $13 for the Pro version, which adds features like a Refresh All button and also removes ads. The new and updated apps join an ever-expanding array of tax-filing options in the App Store. 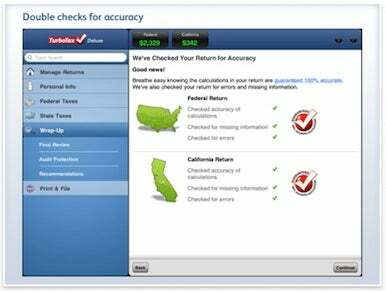 Earlier this year, Intuit expanded its TurboTax SnapTax offering for the iPhone to all 50 states; previously, the app for filing 1040EZ forms had only been available to California residents. Taxsoftware.com also has an iPad offering for filling out tax forms on Apple’s tablet. Updated at 2:50 p.m. PT to include more information on tax applications available in the App Store.